Combining top-tier luxury with practical value, the 2016 Hyundai Equus in Dallas is an exceptional full-size sedan you'll be proud to flaunt around the valley. Not only does the Equus come with an extraordinary array of standard features, but it also comes with a road presence bound to turn heads and a premium powertrain that will get you from point A to point B in a flash. A top choice in the eyes of our 2016 Hyundai Equus review, this full-size luxury sedan oust rivals with a top-tier bundle, while simultaneously providing one of the best values around. While this year's Hyundai Equus rolls in with only a minor feature upgrade, the introduction of a Hands-free Smart Trunk on the Ultimate trim, shoppers will find all of the most up-to-date technology and innovations housed in this upscale model. From heated and cooled front seats, a Lexicon Surround Sound audio system with 17 speakers, a 9.2-inch LCD screen with built in navigation, a leather wrapped heated steering wheel and keyless entry to lane departure warning, blind spot detection, smart cruise control and nine airbags, the Equus comes standard with all of the convenience and safety features that make for a top-of-the-line luxury. It wouldn't be a luxury sedan without premium performance, though. Equipped with an Electronically-controlled Air Suspension system and Continuous Damping Control, the Equus provides a smooth ride regardless of road conditions. Plus, the 429-hp 5.0L V8 outperforms the Lexus LS 460 and Audi A8 while the standard, innovative 8-speed automatic is not available on luxury rivals like the Mercedes-Benz S550 and Cadillac XTS. The true icing on the cake in the opinion of our 2016 Hyundai Equus review? The supreme 126 cubic feet of interior space beats out rivals and delivers comfort that cannot be found elsewhere. 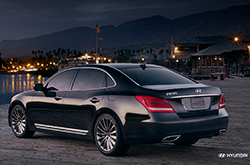 An elite choice from top to bottom, the bold 2016 Hyundai Equus in Carrollton is a superlative choice for local drivers. Luxury you'll have to see to believe, this full-size sedan is available and ready to be test driven at our dealership near Dallas today. 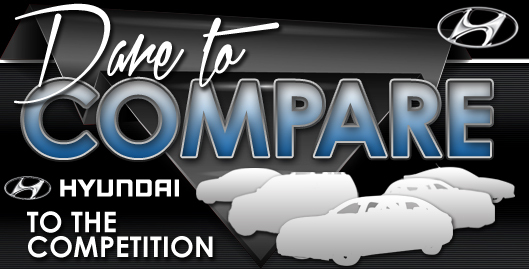 When you compare Hyundai's newest Equus model alongside the 2016 BMW 5 Series, Lexus LS and the Cadillac CT6, you'll find out that it outperforms the competition. 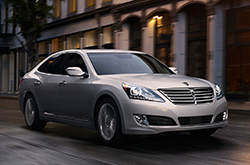 You'll be smitten with the Equus's long list of great qualities, including its competitive pricing and unique features. When comparing its price to the forementioned vehicle options you will undoubtedly see that Carrollton Hyundai customers select it because it's a remarkable value. Look through our bullets for more information! We take the time to publish informative reviews of the 2016 Equus and other Hyundai models because we want to help make your vehicle search simpler. Don't stress out over your next purchase; look to the well&$45;respected Hyundai franchise in Carrollton for thoroughly researched reviews written by industry specialists. Filled with worthwhile facts and specs, including cargo capacity and other info, each section gives you full access to everything Hyundai's lineup has to offer. 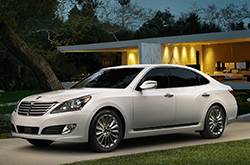 Thank you for reading Van Hyundai's 2016 Equus review. Now that you know more about the Equus, reach out to us to learn about current lease offers and regional OEM deals that can help you save on your purchase.